If you have an questions about the simple RC controller made from the Arduino Uno, the joystick shield and the NRF24L01 radio module then this is the place to ask them. Here is a picture of the basic controller. This reply was modified 3 years, 8 months ago by RC Tractor Guy. I can not find the receiver program may share program related to the receiver it? There Will mean the program of this line.Think very much. 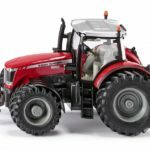 The code for the receiver of that tractor is found here and is described as the code for the Arduino in the cab of the RC Massey 8680. I needed extra pins for this model so a second Ardiuno in the body of the tractor controls the motors and other LEDs, this code is described as the code for Arduino in the body of the tractor. Thank you reply. Hello I would like to ask some questions. The transmitter code is a transmitter can control two different cars? The second question, I crane it has three movements (arm up down and arm lift right turn and load up down), 3 limit determined switch (up limit and down limit and load up limit), a push button switch control solenoid (attract small paperclip, write the name of the gift card inside), I want to use the RC tractor Guy modify basic controller functions to control the crane, I would like to advise you how to do? Can I crane prototype photos posted on the forum? Yes the code can control two or more RC cars so it is different to your code, I’ll make a start on some new code for you since I think I see an easy way to do what your want. I’ll post the code here because it’s quite different to this code. 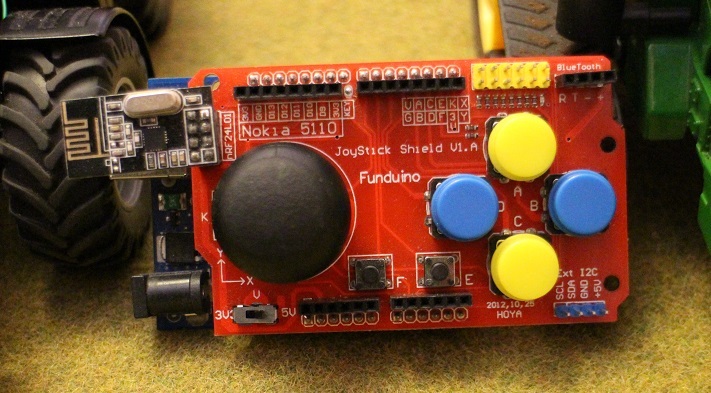 Is it posable to wire in another joystick onto the right of this RC controller using a PCB board. But i expect this would mean changing the codes. If this is not posable can you control the tracks on the 8360RT build from the one joystick, forward/reverse left/right. Yes you have 6 analogue inputs on an Arduino Uno so that is six potentiometers, there are two per joystick so you can have up to 3 joysticks. I am working on new code as I’ve made many changes to suit the new controller I designed and one change I plan to make is to change the tracked tractor code so that I can control it in the same way as the other tractors. The reason is that it makes the code more manageable when your controller has to deal with many different vehicle configurations and it will allow me to control the tracked tractors using the basic controller if I need to. Hi Thank you for you help could you answer one no two question for me I have looked to see how a second joystick could be wired in if you are using a joystick shield with one already attached and would this affect the codes. Thank you for pointing out the Schematic drawings they are very easy to follow. I see you are using a 5volts Arduino in the body!! One other thing I want to use the 3.7volts LiPo battery to drive the tractor and not have back up from a trailer. I think I will have to constructed a way to change the battery my often. Just waiting for the rest of my parts to come through. I have the Tractor, and I will braze a small plate onto the end of the axle cut it in half first and fix this to the outside of the rear wheels because there is a nice large cover that covers that part. Thanks again it is great that there is someone to ask. is there an exsample of reciever code, that fits to this basic transmitter code? I have the arduino shield with 6 buttons + joystick and the Massey 8680 code for 2 arduinos in cab and body is a bit overkill for my first project. I find it dificult to merge the code for cab and body into one codepice for one single body-arduino. I basicly only need joystick x + y for speedcontrol and steering and the 6 buttons for light, front hydraulic-servo and a trailer function. Btw: Thanks for all the inspiring content! To be honest the code has changed so much over the last year I have trouble remembering which codes work together 🙂 I’ve been working on new code for the controller I designed so today I went back and modified the code for the basic controller to match. These are in library form to make it easier for most people, you might want to modify the code yourself. If you just need to modify the command string you can do that and update it as shown in the example. If you need to do more then just right click on the .cpp file and change whatever you want there rather than the sketch is probably the best way to do it.